Everything you need to teach this chapter! Includes 32 of my products which are listed individually for Bien Dit 1 chapter 3. Includes 21 of my products which are listed individually to learn and practice family vocabulary in French. 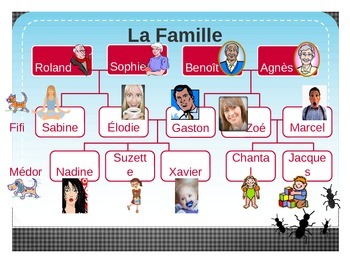 Slide 1 has a picture of a family tree. There are 4 slides with a total of 40 sentences for the teacher to read out loud. Sentences progress from simple with obvious answers (Je suis blond. - Xavier) to more complex so that students need to consider possibilities and eliminate as descriptions progress (Je suis mince. Je suis grande. Je suis sportive. Je suis rousse. - Sabine). 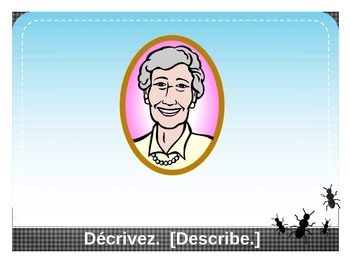 There are then 11 slides with pictures only for students to give descriptions (can be used for oral or written work). Vocabulary corresponds to Bien Dit 1 chapter 3, but may be used with any text. Easy to edit to match vocabulary to your book.